Trip page This page contains excerpts from several sources. It is gathered as background information for a write-up of trips over the Ruhr Reservoirs. © This personal webpage with excerpts from several sources has been created under 'fair use' copyright as background information for trips we made to the dams region. All copyrights remain with the copyright holders named in the references. If you wish to use copyrighted material from the webpage for purposes of your own that go beyond 'fair use', you must obtain permission from the copyright owners. As a private pilot, I had flown already several times over the Ruhr district before I knew that, at one time during World War 2, dams in the area had been subject to air attacks by the British. As aviation interests me, I did a search about it on the internet. The searches returned thousands of mostly British results with stories, articles, books, movies, TV-shows, fansites, etc. of popular nature about the "Dambusters". A raid against German dams had taken place, and it is a famous story in Britain. As one British author wrote, "if there were one single event during the whole of the Second World War in which the British would take most pride, even up to this day, then it has to be the audacious attack on German dams". With these sentiments, the impact of the raid is still debated by some people in Britain. On one end of the spectrum people say that the raid was merely a propaganda victory, with just civilian casualties, mostly women and children, and the majority not even German. On the other end of the spectrum people insist that the dams raid was a glorious British success that made Britain win the war. Further reading of more scholarly works was required. There are already many articles describing the development of the bouncing bomb and the raid itself, amongst them the website of the British air force RAF with a depiction of operational details. This page reflects on the impact of the raid against the described goals and predicted results of the air strikes that were drawn-up during the preparation of the operation. The Ruhr district (German: Ruhrgebiet), which derived its name from the river, was a sleepy, mainly rural region up to the 19th century when coal mines and blast furnaces gave a new look to the countryside and transformed it into the "land of a thousand fires". The discovery of coal on the banks of the Ruhr is lost in the mists of the Middle Ages. First it was extracted in rather small pits; but coal mining saw a dramatic upsurge during the industrial revolution and a move northwards following the geological path of the coal seams. 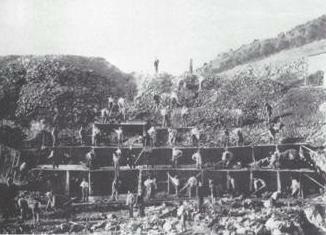 In 1850, there were 198 coal mines in the region, and just seven years later their number had increased to 295. Also the heavy industry expanded rapidly. While in the 1830s, Krupp in Essen employed no more than 50 to 80 workers in the foundries, its workforce increased to 10,000 in the space of just 40 years. And as the industry continued to grow, so did the need for human resources. Migrant workers first came from nearby regions, like the Sauerland, Westphalia, the Netherlands and Belgium, then mainly from the eastern provinces of the German Reich, like Masuria. Formerly rather quiet rural places developed into cities which, growing together more and more, formed the Ruhr district. Problems of water management arose essentially at the end of the 19th century. 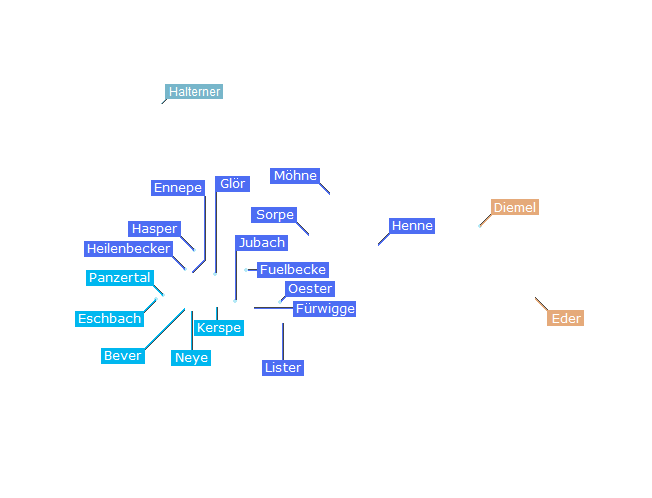 Each of the rivers was given a different function: Ruhr, drinking water supply; Lippe, industrial water supply; and Emscher, waste water discharge. 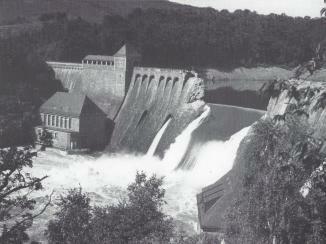 The increasing demand for water led to the construction of dams in the Bergisches land and the Sauerland. In 1891 the city of Remscheid completed Germany's first dam in the Eschbach valley to provide a reservoir for drinking water. The nearby town of Lennep followed with the Panzertal dam. In 1896 the first two dams in the drainage basin of the Ruhr, the Fuelbecke and Heilenbecker, were built to supply local drinking water. In December 1899, the Ruhrtalsperrenverein (Ruhr Valley Dams Association) was established to further support dam building in the drainage basin of the River Ruhr. The Association provided subsidies to support small dam-building co-operatives, and in 1904 dams in the valleys of the Hasper, Furwigge, Glör and Ennepe were officially opened. 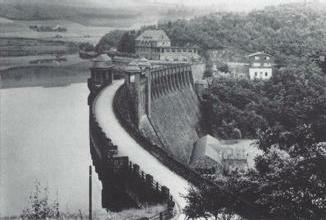 The Ruhr Valley Dams Association was given a legal framework when the Water Act of 1913 was passed. The Association had already decided in 1906 on a major project, the Möhne dam. The dam was built between 1908 and 1913 to help control floods, regulate water levels on the Ruhr River downstream, and generate hydro-power. 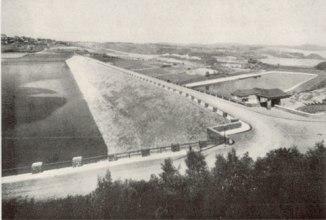 The Sorpe dam was constructed from 1922 to 1935. 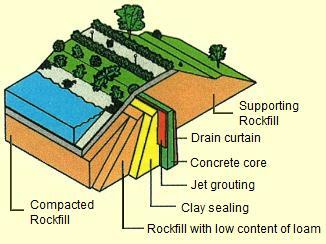 It is an earthfill embankment with a watertight concrete core wall. 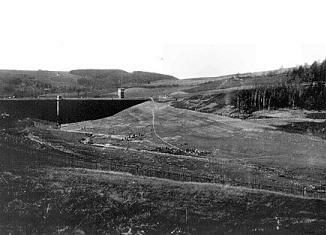 It was at the time the second biggest Reservoir in the Sauerland. The Sorpe dam forms a reservoir with sufficient resources to supplement the others in the drainage basis of the Ruhr during the so-called 'double dry years'; the situation when the precipitation is below average for two consecutive years and when the other reservoirs are unable to meet the needs of the Ruhr area. The Sorpe reservoir has a 'one year plus reserve'. This means that the reservoir has a capacity greater than the annual average of waters entering from the drainage basin. 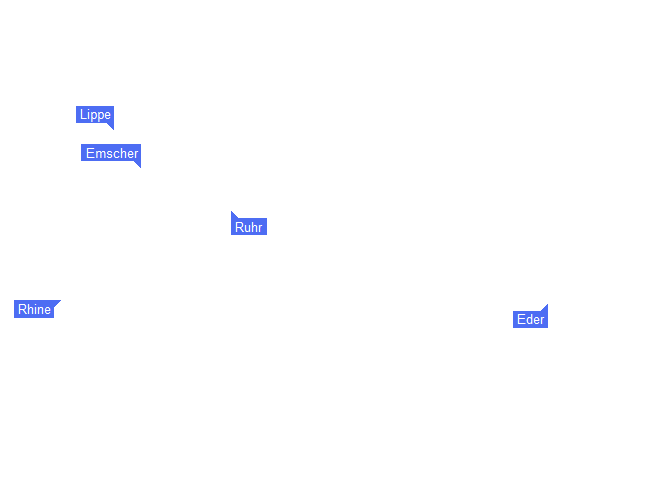 Other dams serving the Ruhr area are the Lister (1912), the Henne (1905), the Kerspe (1912), Jubach (1906), the Bevertal (1898 and 1939), the Neye (1909), the Oester (1906), and the Stever (1930). The Stever dam was built from 1927 to 1930, and is part of the Haltern Waterworks that went into operation in 1908. The reservoir is now commonly referred to as the Haltern reservoir, and part of the largest drinking water production plants in Europe. Surface water is introduced into the Halterner sands via infiltration basins. The Eder dam was constructed between 1908 and 1914. It was built to generate hydro-electric power and regulate water levels for shipping on the Weser River, and the Mittelland Canal that was under construction. Part of this plan was also the Diemel dam that was constructed from 1912 to 1924. The Eder and the Diemel do not provide water to the Ruhr district. 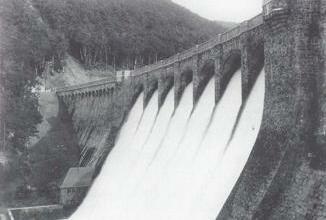 As early as September 1937, the RAF had prepared detailed intelligence reports on the largest German dams. The preferred targets of the Air Staff were the armaments factories of the Ruhr district, and the waterways of the River Weser and the Mittelland Canal along which war materials would be transported. After war broke out, the British developed a drum-shaped bomb with a depth charge. Spinning backwards at over 500 rpm, and dropped at a sufficiently low altitude at the correct speed and release point, the bomb would skip over the surface of the water in a series of bounces before reaching the dam wall. Its residual spin would run the bomb down the side of the dam toward its underwater base. Using a hydrostatic fuse, an accurate drop would bypass the dam's defences and then enable the bomb to explode against the dam some distance below the surface of the water. The British had long been fascinated by the great Ruhr industrial region. It was a classic centre of coal, steel, and heavy machinery production. The Ruhr was heavily defended by flak and hidden by perpetual smog. The British were almost obsessed by the great Krupps works, which covered 1,088 acres in Essen, a fabulous centre of the German armaments industry. In fact, the British somewhat exaggerated the importance of the Krupp plants, and of the Ruhr. Except for the synthetic oil plants located on the outskirts of some of its cities, the Ruhr did not produce much that was immediately vital to military operations. It furnished only about a quarter of Germany's war material; it produced only a tenth of Germany's tanks and had only one aircraft engine plant. Nor was the type of machinery in the Ruhr plants susceptible to bomb damage. The Battle of the Ruhr was the first of the major campaigns Bomber Command fought in 1943-1944. The campaign, which included heavy attacks on nearby Rhineland cities such as Düsseldorf, Aachen, and Cologne as well as on the Ruhr itself, began on March 5, 1943 with an attack on Essen. Unusually, for this period of the war, the aiming point was an industrial plant, the Krupp works in the city of Essen. 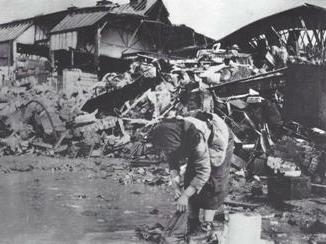 The Krupps works and the city, hit by 1,000 tons of bombs, were heavily damaged. 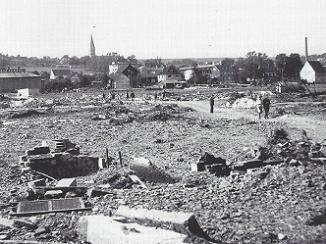 The Ruhr and Rhineland cities suffered greatly; on March 12 Essen was blasted even more heavily than a week earlier. However, weather, mistakes, and bad luck sometimes nullified even the best efforts. Duisburg, the target of more sorties than any other city during the battle, survived four big attacks well but was terribly damaged by a fifth and final blow. The loss of life in the Ruhr and Rhineland, was far greater than from any earlier air attacks of the European war. Two attacks on Wuppertal in late May and June killed 5,200 people. By the end of the Battle of the Ruhr, on July 14, Bomber Command had badly damaged the Ruhr and some other areas and had caused indirect disruption. The Ruhr-Rhineland area as a whole probably lost the equivalent of about one-and-one half months production in this period. The British wishfully supposed that they had permanently crippled these areas, reduced overall German war production, and delivered a terrific blow to German morale. The lesser blow they had in fact dealt had been costly. They had launched 43 major attacks, comprising 18,506 sorties, with 872 bombers destroyed and 2,126 damaged, some of which had to be scrapped. On several attacks the British had sent over 700 bombers. The overall loss rate had been 4.7%; near the maximum Bomber Command could sustain for a long time. On 15 March 1943, during the Battle of the Ruhr campaign, Wing Commander Guy Gibson transferred from 106 Squadron to the headquarters of Bomber Command's 5 Group in order to lead a new squadron formed especially to attack the Ruhr dams. On 24 March 1943 617 Squadron officially came into being at RAF Scampton. One of the main requirements for the use of Upkeep, the code name of the bomb, was that the weapon had to be released at a height of 60ft. With this in mind 617 Squadron had to do a lot of dangerous low-level flying training, sometimes with special equipment to simulate night time flying. 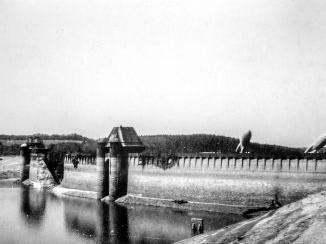 The Air Staff report pointed to the Möhne reservoir as a factor of the first importance in the water supply of the Ruhr. Its destruction would have serious effects on industrial activity and would greatly affect morale, particularly in the light of the recent bombing of the Ruhr and Essen. The construction of the Sorpe dam was such that greater difficulty would be experienced in destroying it with Upkeep bombs, but that it would be by no means impossible. Simultaneous destruction of the Sorpe dam would result in a critical situation in the Ruhr industries and would add greatly to the moral effect caused by the destruction of the Möhne dam. The destruction of the Eder dam would have spectacular results and the moral effects would be important if the operation was carried out in conjunction with the Möhne and Sorpe dams. However, the economic effects would be unlikely to be substantial. 1. This memorandum assesses the probable economic and moral consequences of the destruction of the Möhne dam and the added effects which could be expected from the destruction of the Sorpe and Eder dams. 2. It has been prepared in consultation with the Scientific Advisers to the Minister of Production and with reference to the statements attributed to them in the introduction to the Combined Operations dossier on the Möhne dam. The latter document, on certain points of detail, over-states the expectations of the Scientific Advisers as to the probable economic effects and the following conclusions should be taken as representing their actual views. 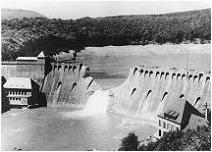 (a) Although the precise nature of the catastrophe which would overtake the Ruhr valley as the result of the release of the greater part of the contents of this dam in the space of a few hours cannot be estimated in advance, it is agreed that there is every prospect that both the physical and the moral effects of the flood which would be produced are likely to be sufficiently great to justify this operation in themselves, even if there were no other significant effects. (b) The destruction of this dam would not necessarily have any large or immediate effect on the supply of industrial and household water in the Ruhr area. The immediate source of the greater part of the Ruhr water supply is the underground water-bearing strata, supplemented by colliery water, water pumped back from the Rhine and water drawn from the Emscher river and canal systems. The purpose of the system of storage dams of which the Möhne dam is largest, is the conservation of rainfall, by means of which the level of the underground water can be maintained and protected from permanent depletion. In an emergency, a large and possibly adequate volume of water supplies might be obtainable for some months by drawing heavily on these underground supplies and depleting their level. Whether or not such depletion would proceed at a rate or reach the stage where economies in water consumption would have to be introduced would depend upon the amount of rainfall, the speed of repairs to damaged conservation works and the efficacy of emergency measures to obtain additional water (e.g. from the Rhine). If these factors were all unfavourable, a difficult situation might well develop by the end of the summer, but it is not possible to state that a critical shortage of water supplies in the Ruhr would be a certain and inevitable result of the destruction of the Möhne dam. The Sorpe dam is essentially complementary to the Möhne dam and its simultaneous or subsequent destruction would in general reinforce the effects of the destruction of the Möhne dam. In particular, its destruction would very greatly enhance the prospects of the development of a water supply shortage by the process described under section 3(b). 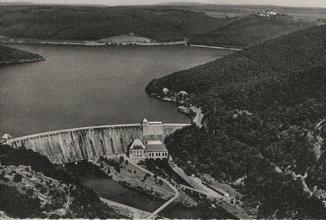 For this reason the destruction of both dams would be worth much more than twice the destruction of one and it is most strongly urged, if the operational possibilities hold out any reasonable prospect of success, that an attack on the Möhne dam be accompanied, or followed as soon as possible, by an attack on the Sorpe dam. (a) The functions of the Eder dam are not related to those of the Möhne dam and Sorpe dam and its destruction would not therefore in any way supplement or reinforce the effects of the destruction of the Ruhr dams. (b) The primary purpose of the Eder dam is flood prevention. 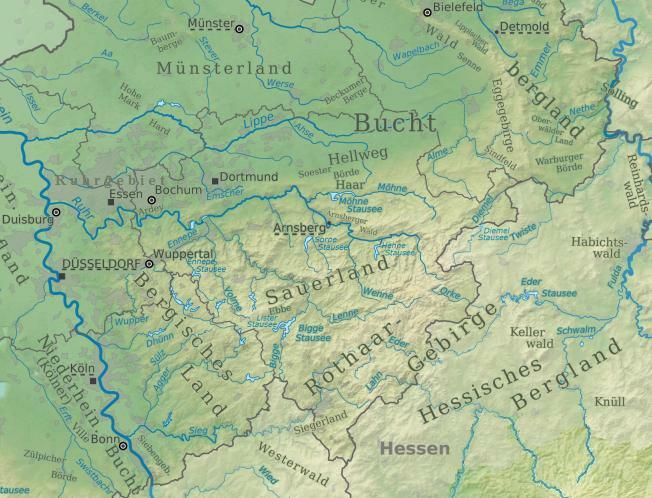 The release of its waters would without doubt result in the inundation of large tracts of land in the Eder, Fulda and Weser valleys but the areas affected are likely to consist for the most part of agricultural land. It is unlikely that any densely populated industrial areas would be affected, apart from the possible inundation of the low-lying districts of the city of Kassel. (c) Although the Eder dam plays some part in the conservation of water for maintaining the navigability of the lower reaches of the Weser and for supplying water to the Mittelland canal, it is unlikely that its destruction would lead to a critical situation in either case. (d) The force of the flood released by breaching the dam would very probably result in the destruction of the four power stations situated below it. While not of major economic importance, this would constitute a useful measure of interference with the operations of the Preussenelektra electricity supply system. 6. (a) The effects of the destruction of the Möhne and Sorpe dams would be witnessed by many thousands of persons who, whatever the true facts, would undoubtedly in view of the traditionally precarious nature of the Ruhr's water supplies become prey to every variety of alarmist rumour regarding the possibility of a shortage of drinking water, the risk of disease, and the inability of the fire services to deal with incendiary attacks. Exceptional opportunities would be presented for successful measures of political warfare. (b) The destruction of the Eder dam would not be likely to affect directly any large centres of population (with the possible exception of the city of Kassel) and its effects would be experienced by many fewer people than in the case of the Ruhr dams. Since its functions are also less intimately connected with the daily life of large populated areas, the total moral effect, though by no means negligible, would inevitably be much smaller than in the case of the Ruhr dams. The MEW wrote that the physical and the moral effects from the destruction of the Möhne dam would be likely to be sufficiently great to justify the operation. However, the destruction of this dam would not necessarily have any large or immediate effect on the supply of industrial and household water in the Ruhr area. The immediate source of the greater part of the Ruhr water supply is underground water, backfilled by the reservoirs during droughts and dry seasons, and supplemented by the Rhine and canal systems. A difficult situation might develop by the end of the summer if rainfall, speed of repairs and measures to obtain additional water were all unfavourable, but it would remain uncertain. The destruction of the Sorpe dam would reinforce the effects of the destruction of the Möhne dam. It would greatly enhance the prospects of the development of a water supply shortage. 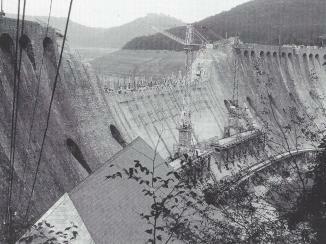 The additional destruction of the Sorpe dam was strongly urged if it would hold out any reasonable prospect of success. The effects of the destruction of the Eder dam would be experienced by many fewer people than in the case of the Ruhr dams. The areas affected would be likely to consist for the most part of agricultural land. It would be unlikely that the destruction of the Eder dam would lead to a critical situation for maintaining the navigability of the lower reaches of the Weser or the supply of water to the Mittelland canal. The four power stations below the Eder dam were not of major economic importance. The River Ruhr is a relatively small highland river. The reservoirs primary task is not the immediate supply of drinking and service water to the area's inhabitants and industry, but ensuring water supply by maintaining minimum runoff levels in the River Ruhr to protect the underground water table which supplies for industrial and household purposes. 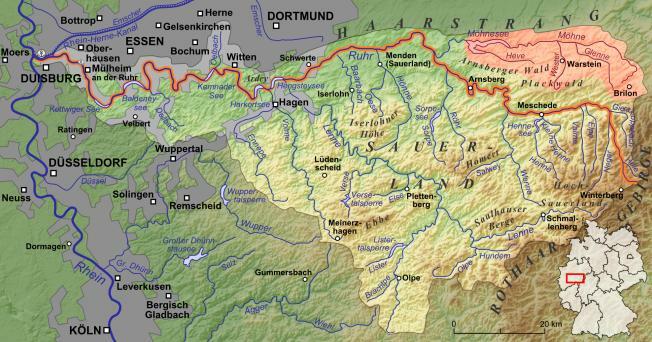 The total watershed area of the River Ruhr is 4,485 km2. The catchment area of the Möhne reservoir is 436 km2. Assuming a uniform distribution of precipitation, roughly 10% of the annual water-flow of the River Ruhr is regulated by the Möhne dam. The storage capacity of the Möhne reservoir is 134.5 M.m3 of water. The mean annual inflow is 192.4 M.m3 of water. In 1943, there were 12 reservoirs upstream in the watershed of the River Ruhr, plus 6 more outside the watershed of the River Ruhr serving the Ruhr district, including the important Haltern Waterworks. 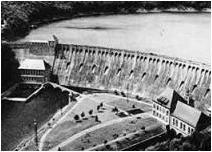 The Office of Scientific Advisors to the War Cabinet provided reservoir capacity data for the reservoirs in the watershed of the River Ruhr; Möhne, Sorpe, Lister, Ennepe and Henne, totalling 254 M.m3, and mentioned a "further seven small dams" with a total storage volume of approximately 12 M.m3, bringing the total capacity up to 266 M.m3. The scientists did not take the reservoirs outside the watershed of the River Ruhr into account. Bergisches Land and Sauerland reservoirs serving the Ruhr district. The reservoirs are used to 'backfill' the aquifer during droughts and dry seasons, thus maintaining adequate quantities of water underground. 1) Reservoir capacity watershed River Ruhr; volume data from the scientists' data; percentage distribution reservoir capacity. The scientists put that the Möhne reservoir held 50% of the total reservoir capacity, and that the Möhne and Sorpe together held over 75% of the total. 2) Reservoir capacity wathershed River Ruhr; volume data from Ruhrverband publications, completed with German Wikipedia data and excluding post-war expansions; percentage distribution reservoir capacity. 3) As 2), plus the five reservoirs south of the watershed of the River Ruhr serving the Ruhr district; percentage distribution over all reservoirs. The Haltern Waterworks, built in 1908, is the foundation for the drinking water supply in the northern Ruhr district, the city of Duisburg, and the Münsterland. Originally groundwater was the supply at Haltern. When this became inadequate, surface water from two small rivers was used for groundwater augmentation. 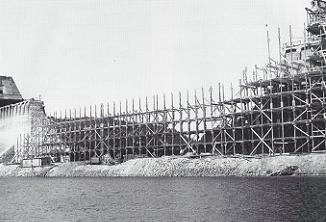 From 1927-30 a sheet-pile cutoff was built on the Stever River near the city of Haltern to form the Haltern reservoir (official: Stevertalsperre Haltern). From the reservoir water is diverted to spreading grounds to augment the underground water storage. 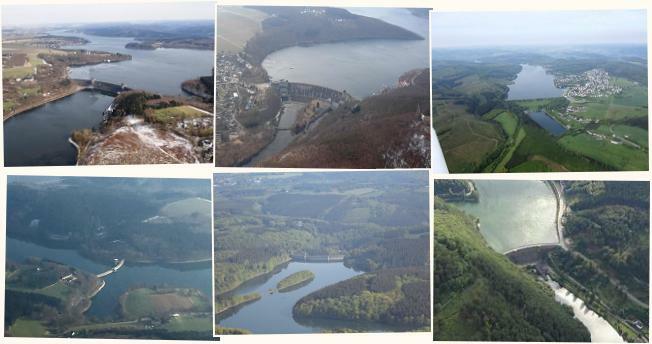 The catchment area of the Haltern reservoir is 880 km2, more than twice the catchment area of the Möhne reservoir (436 km2), and more than all catchment areas of the Bergisches Land and Sauerland reservoirs combined (806 km2 in 1943). The up to 300 m thick sand layers have a surface area of about 770 km2, and a high ability for water storage and water transport. The theoretically usable underground water volume is 17,000 M.m3. During dry periods, water from the Dortmund-Ems canal is transferred into the Haltern reservoir. 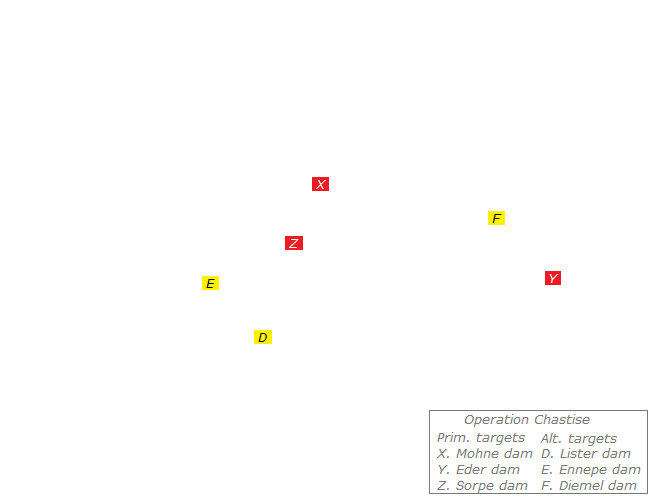 The Möhne dam was designated Target X. The Eder dam, in the watershed of the River Weser, was designated Target Y. The Sorpe dam was Target Z, and designated next in importance after the Möhne. Three minor dams were added to the target list in case the Möhne, Eder or Sorpe were, for any reason, unable to be attacked. Target D was the Lister, the southernmost dam. Target E was the small Ennepe. The Diemel, between the Möhne and Eder and in the watershed of the River Weser, was designated Target F. It had replaced the Henne, in the watershed of the River Ruhr, due to the possibility of heavy flak near the town of Meschede. On Saturday, May 15 1943, while the Battle of the Ruhr raged, the order to attack to take place at the 'first suitable opportunity' was delivered to the Air Force command. The draft operational order, with a more stimulating depiction of the estimated impact for the operational crews, was finalised and forwarded to Scampton. APPENDIX 'A' - ROUTES AND TIMINGS. APPENDIX 'C' - LIGHT AND MOON TABLES. 1. The inhabitants and industry of the Ruhr rely to a very large extent on the enormously costly water barrage dams in the Ruhr District. Destruction of TARGET X alone would bring about a serious shortage of water for drinking purposes and industrial supplies. This shortage might not be immediately apparent but would certainly take effect in the course of a few months. The additional destruction of one or more of the five major dams in the Ruhr Area would greatly increase the effect and hasten the resulting shortage. TARGET Z is next in importance. 2. A substantial amount of damage would be done, and considerable local flooding would be caused immediately consequent on the breach of TARGET X. In fact it might well cause havoc in the Ruhr valley. There would be a large loss of electrical capacity in the Ruhr partly caused by destruction of hydro-electric plants, but also due to loss of cooling water for the large thermal plants. 3. In the Weser district the destruction of the TARGET Y would seriously hamper transport in the Mittelland Canal and in the Weser, and could probably lead to an almost complete cessation of the great value of traffic now using these waterways. 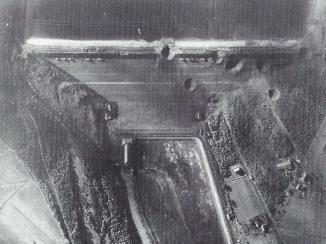 The Upkeep bomb was designed to attack arched dams, such as the Möhne, Eder, Lister, Ennepe and the Diemel. The Sorpe was an earth-work embankment with a concrete core wall construction type of dam, and the bouncing bomb was not designed, and not tested, for this type of structure. The aircraft were to attack the Sorpe dam parallel to the length of the dam, and aim the bomb without spinning it to hit the water just short of the centre point of the dam, about 15 to 20 ft out from the edge of the water. The first wave of nine bombers were to attack the Möhne and Eder dams. 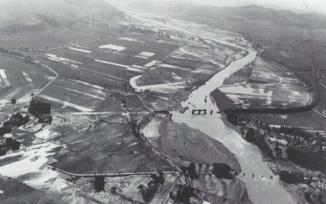 If the attacks were successful, the remaining aircraft of the first wave that had not yet used their bomb were also to attack the Sorpe dam. 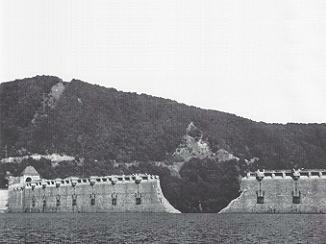 The second wave of five aircraft was to attack the Sorpe dam that was next in importance after the Möhne. The second wave was launched just before the first wave, as it had a longer flight route. The third wave was scheduled 2.5 hours later and consisted of the remaining five aircraft. It was to form an airborne reserve that would receive their orders while airborne, pending the results of the attacks by the first two waves. Failing receipt of the order which target to attack, the Lancasters were to proceed to the Möhne, Eder and finally, last resort targets in that order attacking any which were not breached. The plan to attack the Möhne, Eder and Sorpe was prepared in detail. The plan to attack the last resort targets was not. On Sunday evening May 16, 1943, the attack, under the code name Operation Chastise, went underway with nineteen Lancaster bombers, each carrying one Upkeep bomb. The bombers left Scampton base in three waves. On the way up to the dams, two Lancasters had to abort and return to base, two bombers were shot down, and two bombers crashed. The first bomber that reached the Möhne dam missed the target. The second bomber that reached the Möhne dam was hit by flak and crashed. Two crew members survived. The third aircraft was damaged in the bomb run, but the bomb exploded near the dam. The fourth aircraft also made a successful attack, with its bomb exploding near the dam. The fifth aircraft finally was able to breach the Möhne dam. Five of the bombers continued to the Eder dam, of which three still had their Upkeep bomb. The first bomber tried multiple times, but was not able to get in the right position to release the bomb. The second bomber's bomb hit the top of the dam and severely damaged the aircraft in the blast. The first bomber made another run and successfully dropped the bomb. 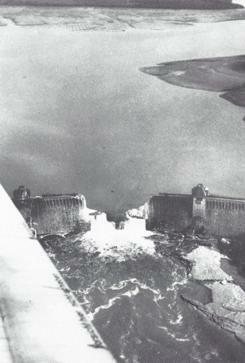 The third bomber was able to breach the Eder dam. In the meantime, the first bomber to arrive at the Sorpe dam released the Upkeep bomb at the 10th bomb run, but did not breach the dam. The second bomber's bomb exploded within 30 metres from the first one, but also failed to breach the dam. 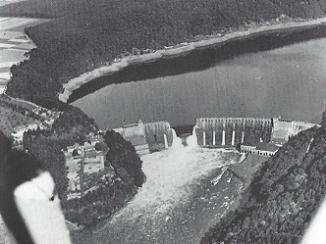 The remaining two bombers were sent to last resort targets, of which the first bomber was shot down en-route to the Lister dam with one crew member surviving, and the second bomber probably attacked the Bevertal dam by mistake rather than the Ennepe dam, and dropped its bomb without harming the dam. In post-strike documentation and public information releases - including the official report to the War Cabinet by Secretary of State for Air Archibald Sinclar - it is stated that Townsend and his crew attacked the 'Schwelme Dam'. Schwelme is a town lying partway between the Ennepe and Bever and has no lake or dam of its own. By claiming that Townsend's attack was against this (fictious) dam, and associating the correct target with a location close to the actual attack, the Air Ministry concealed the fact that the wrong target was hit. That this is a post-strike fabrication is evidenced by the fact that the descriptor 'Schwelme Dam' does not occur in any of the mission planning documentation. Interestingly, Townsend's crew received more awards than any other crew involved in the Dams Raid except Gibson's. On the way back, two more Lancasters were shot down. In total, eight of the nineteen Lancaster bombers were lost, and two seriously damaged. Of the 133 men who took part in the raid, 53 lost their lives and 3 were captured having bailed out. The loss rate was 42%. Only the first wave had been successful in breaching two of its targets. A depiction of the operational details is available on the RAF website (link at the bottom of this page). 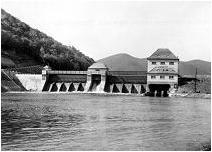 The attack on the Möhne dam was carried out during the period when the reservoir was full. 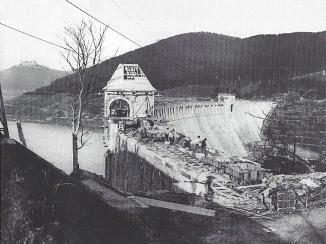 The bomb breaching the dam exploded close to the face of the dam approximately 10m below the water surface, and breached the upper part of the dam. A gap 76m wide at the top and 22m deep developed in the centre of the dam. Within the next 12 hours 116 M.m3 of the 132 M.m3 (almost 88%) of water contained in the reservoir escaped. In the narrow Möhne valley near Niederense this caused a surge 10m high which caused great destruction. More than 1,500*) lives were lost. A large part of the flood victims fell between G�nne and Wickede. The total number of casualties is not exactly known because many bodies were not found, and it is not known how many foreign forced workers were exactly in the camp at Neheim. 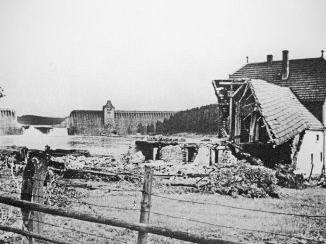 Buildings situated on low ground along the Möhne and Ruhr Rivers between the dam and Hagen were either swept away or damaged. Bridges for 50 km downstream from the dam were also destroyed. The power stations, located at the foot of the dam, were destroyed. 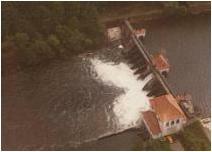 The pump storage power plant at Herdecke could not operate for two weeks, because its power house had been under 2m of water. German historian Ralf Blank wrote that the government of that time issued credible casualty figures with the intention to suppress rumours of many more casualties. According to government figures from two weeks after the attack, there were 1579 deaths, including no less than 1026 foreign workers, with 34 Germans and 155 foreign nationals still missing. In Günne there were already 30 victims in the village. 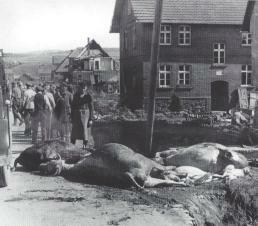 Some of the bodies were taken by the flood as far as Fröndenberg. Niederense�s 700-year-old Himmelpforten (Heaven�s Gate) monastery was swept away by the torrent, taking the priest, his housekeeper and sister with it. 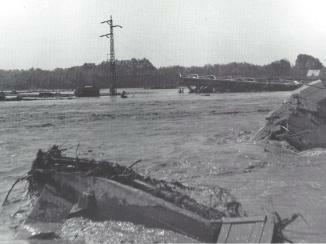 Twenty minutes after the dam was breached, the torrent reached the town of Neheim. Many people were drowned in their cellars where they had gone to shelter from the air raid. The force of the water smashed houses from their foundations, and dozens of houses were carried away. In the valley there was a forced labourers from Eastern Europe women's camp. 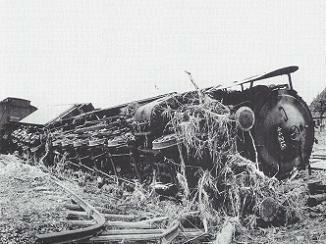 The next morning, hundreds of dead women were lying scattered among wreckage. The bodies of the foreign workers that were immediately recovered were taken away in lorries for burial without coffins in two mass graves at the cemetery. 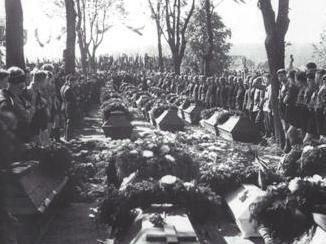 The German dead were taken to a church for identification. 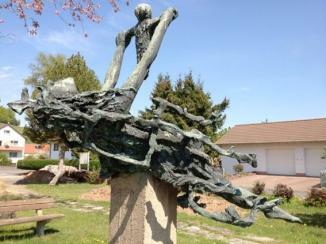 The burial of 53 German victims thus far recovered was on May 20 at the Neheim cemetery. 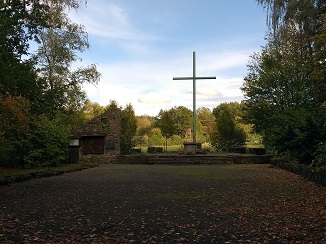 The bodies of 479 unidentified women lie in a mass grave at the Neheim cemetery. All were forced workers from the Soviet Union and Poland. 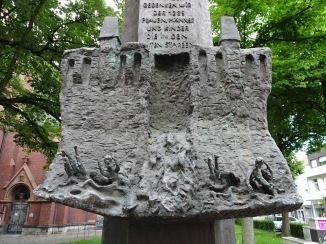 The burial registers of Neheim recorded the names of 529 unnamed labourers. Subsequent burials comprised 59 French prisoners of war, 9 Belgian prisoners of war, 14 Dutch civilian workers and 49 unnamed persons. Over 250 female forced workers remained unaccounted for. On its way through the Ruhr valley, the torrent passed the small town of Wickede an der Ruhr at about 2am. The identification of the dead proved extremely difficult in Wickede as some of them had been washed downstream from Neheim and Günne. 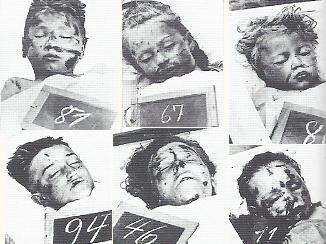 Other bodies were still found months later as far away as the Essen area. A dossier was prepared containing information about where each corpse had been found with a description of personal possessions. 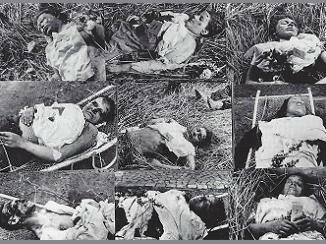 The unidentified were buried in a mass grave. 118 residents of Wickede were killed. 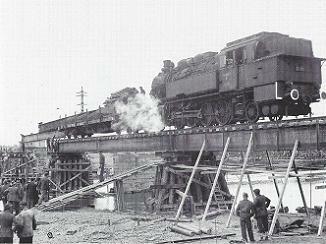 The destruction of the railway bridge at Wickede caused the most serious interruption to one of the main stretches of the German railway network, the line leading from the Ruhr district to Kassel. As the route was a major supply line between the Ruhr and the Eastern Front, the repair of the bridge was given top priority. 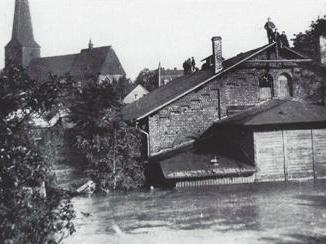 The flood reached the town of Fröndenberg at 2.45am. 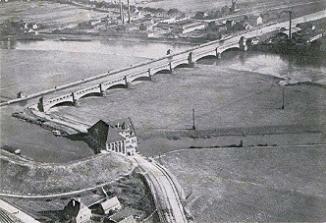 The flood destroyed the road and the railway bridge over the Ruhr. Eleven houses were completely destroyed in the urban area. 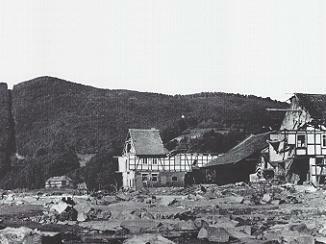 The flood claimed the lives of 34 inhabitants of Fröndenberg. Near Fröndenberg the floodwaters also destroyed a camp where Russian prisoners of war were housed, claiming the lives of 30 prisoners and 4 guards. 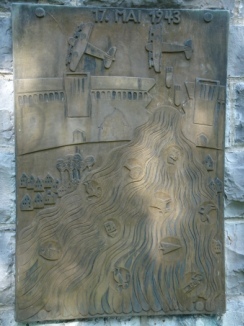 More than 160 unidentified dead, also taken by the flood from upstream places, were numbered with blackboards. After having been fingerprinted and photographed, the corpses were interred in the cemetery. 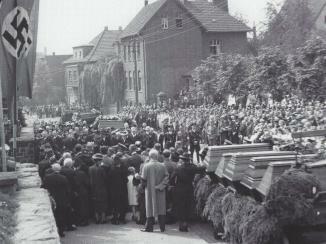 The funeral service for the Fröndenberg victims took place on May 22. Approximately 45 km further downstream from the dam lies Schwerte, where the warning came at 3am. The flood, that was still very strong, reached the town at 5.15am. The floodwater took four hours to pass the town. The railway bridge at Herdecke on the line between Dortmund and Hagen became operational in 1879. 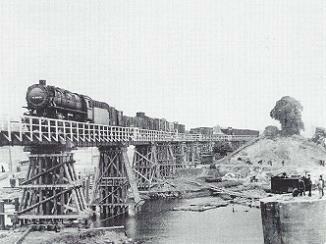 Over the years, the railway bridge had survived many floods that had swept down the valley. This time the flood succeeded in pushing over one of the columns of the bridge. The flood destroyed or severely damaged 343 houses, 14 farmhouses, 52 factories, 9 railway bridges, 25 road bridges, damaged 4000 hectares of farmland, and drowned some 6,000 animals. Waterworks were affected by mud. Initially the damage to the water supply industry seemed enormous. The Möhne reservoir was, after all, an important source of water for the Ruhr area. However, the requirements of the Ruhr coalfields were met by calling upon other deposits. Water was drawn from the River Lippe; more was pumped back from the Rhine to the lower reaches of the Ruhr, and further reserves were obtained from the Sorpe reservoir. As the MEW memorandum of April 2 predicted, the destruction of the Möhne dam alone did not have any large or immediate effect on the supply of industrial and household water in the Ruhr area that could not be resolved quickly. The failed destruction of the Sorpe dam had shrank the prospects of the development of a water supply shortage. 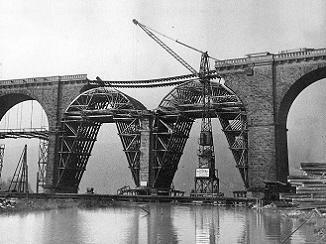 The Organisation Todt had already proved itself capable of largescale construction schemes, and was given the reconstruction project. 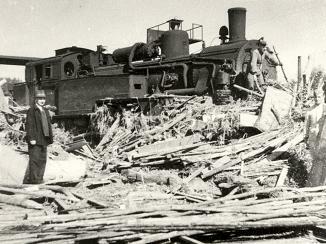 The railway link between Neheim and the Möhne reservoir that had been swept away, was brought up by June 15. Key bridges further down the Ruhr Valley were repaired within weeks, and the mud was removed from the filter beds and water catchment areas of the waterworks. The Organisation Todt (OT) was a German conglomerate of public construction companies developed by the rulers of the Reich. From the start, the OT was a connecting body, a kind of government agency between the authorities, who decided what public and military works were to be done, and civilian building companies and firms, whose task it was to realize them. The driving force behind the OT was architect and engineer Fritz Todt. The already existing concept of modern highways was continued by the new government in 1933, and Todt was appointed as inspector-general of the German Roads. Todt commissioned a large number of building companies to work on the motorways. In 1938, Fritz Todt's conglomerate of companies was commissioned to build bunkers to fortify the border with France, called the West Wall by the Germans. Fritz Todt was appointed national minister for weapons and munitions in March 1940 to centralize all war productions, and became inspector general for water and energy in July 1941. During the war the OT became a huge paramilitary body with 1.4 million labourers. Its tasks became various, and all were connected to the war effort: building, repair and establishment of roads, and support of army engineers. After the end of the war on the Western Front in 1940, OT personnel repaired railways, roads, bridges, ports, canals and airfields, but soon the tasks became even broader. 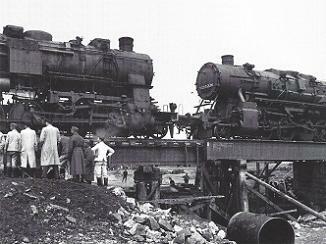 In summer 1941, the OT was engaged in Russia and, following the conquering Wehrmacht, carried out repair work in occupied territories, and built railways, roads, bridges, and facilities. Todt died in a plane crash in February 1942, and was replaced by Albert Speer. As minister of production and armament, Speer entrusted the direction of the OT to Xaver Dorsch. Because of the experience gained from the West Wall, the OT was commissioned to build large-scale fortifications such as the Atlantic Wall and many other defensive lines, notably in northern Italy and Russia. The OT was also the key builder of the gigantic U-Boat bases on the Atlantic coast. In all occupied lands, the OT subcontracted local firms and employed individuals to help construct military installations and bunkers. 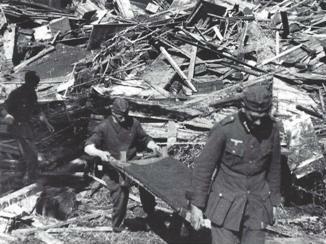 Originally the OT's field of operations was confined to foreign occupied territories, but as the Allies intensified the air bombardments of German towns in 1943, several new OT operational groups (Einsatzgruppen; EG) were created to clear the damages and rebuild the destroyed installations at home: EG Tannenberg, EG Rhein-Ruhr, EG Kyffhauser, EG Oberrhein, EG Hansa, EG Alpen, and EG Deutschland. With the war enduring, much larger numbers of Prisoners of War and other forced labourers were employed, effectively treated as slaves, as more Germans were conscripted into the regular army. Also 1.5% were concentration camp prisoners. In order to repair the Möhne dam, clearance work was already underway on May 28. 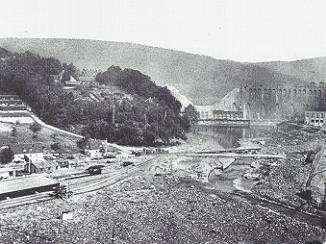 First loose stonework was removed from the dam, and the rebuilding of the dam began on July 9. The construction sites were well organized. 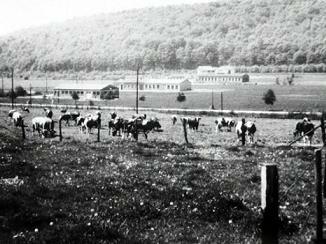 Including auxiliary workers and quarrymen, the worksite at the Möhne consisted of 2,500 men. 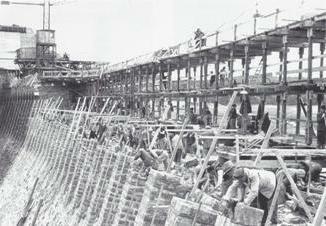 About 100 conscripted Dutch carpenters built a massive scaffolding. Wood was used as an economy measure since the armament industry had first call on any precious steel. 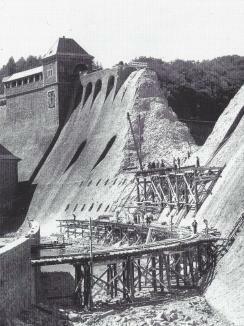 On the Möhne, work was supervised by a foreman who had been a supervisor when the original dam was built in 1908-12. The existing stonework below and at the sides of the breach was sealed by a process of injections on both sides of the wall. Liquid cement was forced into boreholes at high pressure in order to seal cracks and harden the masonry. Reconstruction work at the Möhne proceeded more smoothly than had been expected. The work was completed by September 25, six days in advance of the planned date, and just 79 days after work had started on July 9. Like the Möhne reservoir, the Eder reservoir was full at the time of the attack. 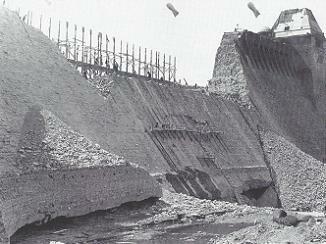 The bomb that breached the dam created a gap on the left side of the dam of 70m wide at the top and 22m deep. Within the next 36 hours 154 M.m3 of the 202 M.m3 (approximately 76%) of water contained in the reservoir escaped. 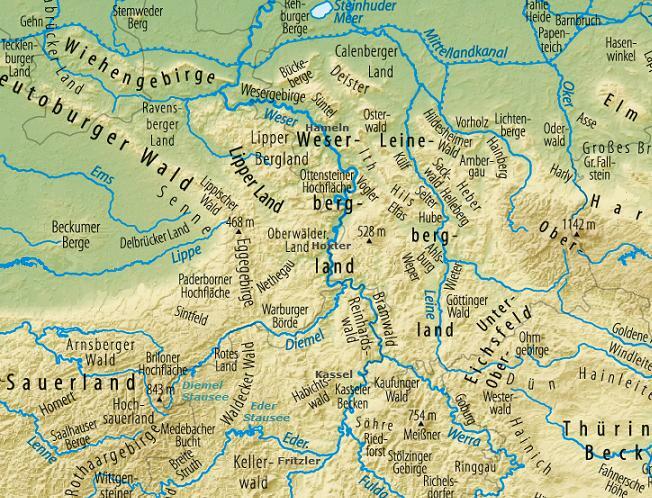 The flood wave which was able to spread easier in the much larger Eder and Fulda valley, did not have the same destructive effect here as it had in the narrow Möhne and Ruhr valley. 68 people drowned between the Eder dam and Kassel. 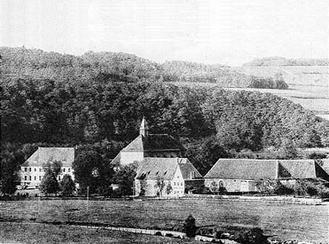 The Eder valley was less densely populated than the Möhne and Ruhr valleys. Another factor contributing to the low death toll was an unofficial telephone alarm system which saved many lives by warning people in outlying districts before the flood arrived. On the water side of the dam, the explosion damaged the turbine inlet valves. Six emergency outlets were slightly damaged and developed leaks from which plumes of water poured out. The Hemfurth I & II power stations, right and left of the dam, received some level of damage, as probably did the Waldeck Pumped Storage Station, and reportedly did the small Affoldern power station. Many villagers were able to clamber to safety up the nearby slopes thanks to the early warnings they received. In some places, the topsoil was completely stripped from the landscape and elsewhere the ground was left covered with scree. Eight houses and six commercial buildings were totally destroyed in the low-lying parts of Hemfurth. The railway bridge of the Bad Wildungen-Korbach-Brilon line was cut between Giflitz and Bergheim. The nearby roadbridge was washed away. 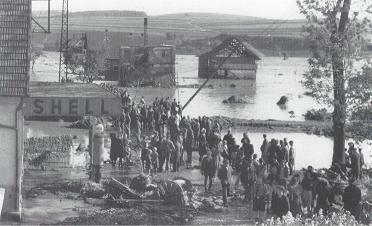 The flood at one time covered the Luftwaffe airfield at Fritzlar. Since the end of 1939 hangar space at Fritzlar airport was mostly redundant. Starting in 1941, the facilities were used as a backup operation of Junkers aircraft. In the course of 1943, testing, production preparation and the order for series production of the new transport aircraft Ju 352 was relocated from Bernburg to Fritzlar. Following the first flight of the Ju 352 from Fritzlar on October 1, 1943, series production of this aircraft began at Fritzlar airport. 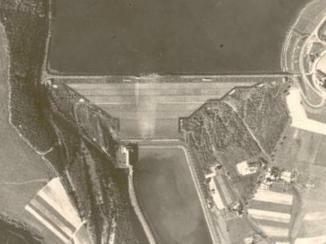 Following the Eder dam breach, Fritzlar airfield, 20 km downstream from the Eder dam, was flooded by approximately one meter of water. The Junkerswerke workers were alerted in time to move to the upper floors of their blocks of flats. 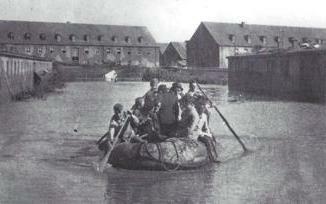 Foreign workers of the Junkerswerke were brought to safety with rubber dinghies. In the afternoon, the muddy ground floors could be reached again and in the evening trucks were able to drive back to the area to take care of the relief. The bombing of the Eder dam had no significant effect on the production lines. The production of the Ju 352 was delayed only a few weeks due to clean-up work. 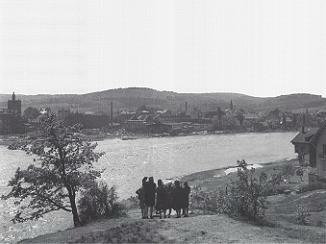 The Eder valley and the Fulda flooded as far as Kassel over 60 kilometres to the north-east. The floodwater reached the city at around 10am with the water level continuing to rise until 3pm, when it began to fall away rapidly. As a period of several hours elapsed between the report of the breach in the dam and the arrival of the floodwater, overnight warnings had already been issued to the areas likely to be affected. This enabled people to move their possessions from cellars and basements to upper floors. The Power Stations Hemfurth I (13,000 kW) from 1915 and Hemfurth II (17,000 kW) from 1933 were situated at the foot of the dam. The second bomb caused a short circuit at Hemfurth I. The power stations were damaged but remained standing. After 77 years of operation, the obsolete machines of the Hemfurth I power plant were shutdown on May 11, 1992, and renewed. Hemfurth II was finally shutdown in 1995. In Hemfurth was the pump storage power plant Waldeck, which with its four turbines had a peak output of 115,000 kW. The power plant was commissioned in 1932. The second phase, called Waldeck II, was opened in 1975 with two turbines. After 75 years, at the end of its technical life, the Waldeck I power plant was decommissioned in two steps in 2006 and 2008, along rehabilitation works to components of the old plant that would be needed for future operation. At Affoldern at the Eder re-regulation pool there was a small run-of-river power plant with a single turbine delivering 2,560 kW. It was commissioned in 1929. 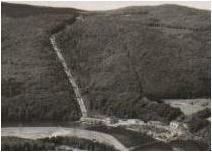 The picture left shows the original Affoldern hydro-power plant from 1929 when it was still there in 1982. Since then, the plant was completely modernized in 1998-99. The Mittelland canal crosses the river Weser over an aqueduct at Minden (a second aqueduct was completed in 1998). The old canal bridge spans the Weser with two arcs. Six additional arcs avoid a water jam even in extreme floods. A pumping station feeds water from the Weser into the Mittelland Canal. 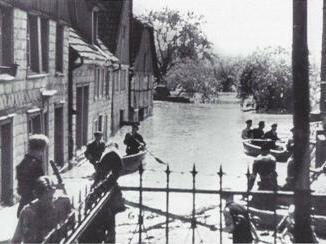 The flood from the Eder dam attack reached Minden after three days. 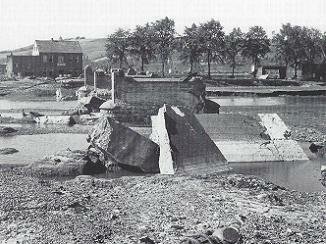 The flood did not damage the aqueduct or the pumping station, and did not affect the Mittelland canal. 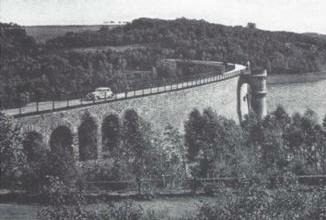 At the end of World War II, the aqueduct was destroyed by the retreating Wehrmacht. 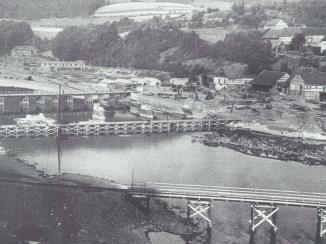 In 1949, the renovated bridge was opened again. As the MEW memorandum of April 2 predicted, the areas affected consisted for the most part of agricultural land. 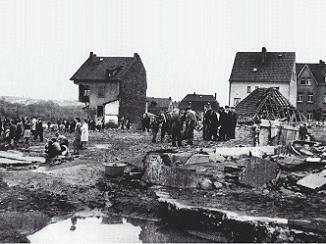 No densely populated industrial areas were affected, and the low-lying districts of the city of Kassel were inundated. The damage of the Eder dam did not lead to a critical situation for maintaining the navigability of the lower reaches of the Weser or the supply of water to the Mittelland canal. 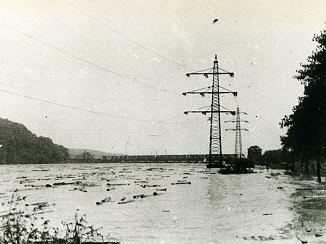 The force of the flood reportedly damaged three of the four power stations below the dam, however did not destroy them. At Hemfurth, temporary rail, road and footbridges were built by army engineers and the Organisation Todt. 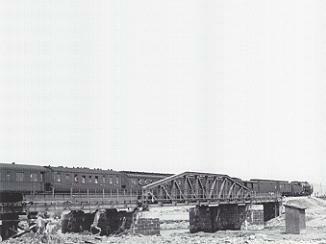 A temporary railway bridge across the Eder valley between Grifte and Wolfershausen was built to reestablish the rail link between Kassel and Frankfurt. The bridge was completed by mid-June. 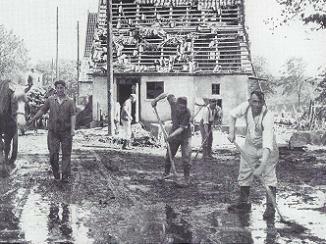 A construction site was set-up in the Eder valley. 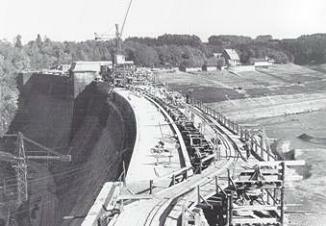 Although the breach in the Eder dam was seven metres narrower than the one at the Möhne, the repairs took longer because of problems with the drainage system. The Frankfurt firm Philipp Halzmann AG worked for the Organisation Todt on this project. It was the same company that had been involved with the original construction. 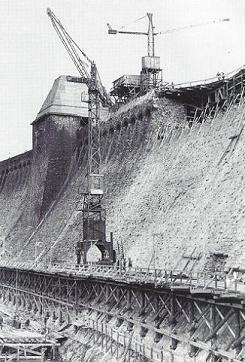 Although the Eder wall was finished at the same time as the Möhne, final reconstruction work was not completed until June 1944 because of difficulties with the drainage channels inside the dam. The water level in the Eder reservoir had to be increased in stages. 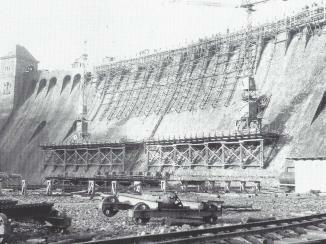 Additional cement injections were carried out after the war, and following inspections, the Eder reservoir was used again to its full capacity. The air attack on the Sorpe dam was carried out at the same hour as the one on the Möhne dam, with the intent to cause them to fail simultaneously. The fact that the gravity masonry dam on the Möhne was ripped open while the earth dam across the Sorpe withstood the attack was of decisive importance. 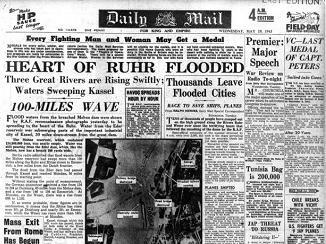 The effect on the Ruhr valley would have been catastrophic if the Sorpe valley reservoir also would have run out during those early morning hours of 17 May 1943, and the two flood waves would have combined and superimposed themselves on each other. 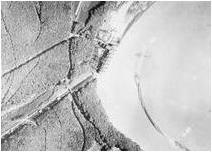 However, inspections using the dam's internal maintenance tunnels found no cracks or seepage. The mission of the second wave to destroy the Sorpe dam with Upkeep bombs appears unfounded. 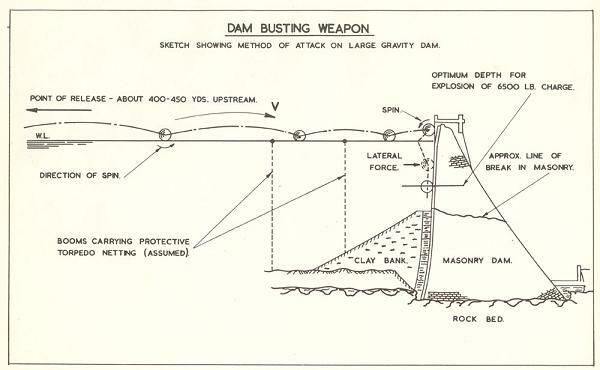 Not only was the bouncing bomb not designed for, and not tested on earth dams, post-war investigations demonstrated that it would have required several charges across the crest of the dam to explode simultaneously to cut through the dam completely. Subsequent explosions partially fill in craters blown by the early ones. For this reason the Sorpe dam also withstood 11 subsequent heavy Tallboy bomb blasts at a further attack on October 15, 1944; one and a half years after the first raid. The second attack was also not successful because the required bombing precision did not yet exist, and the water level in the Sorpe reservoir had been lowered. 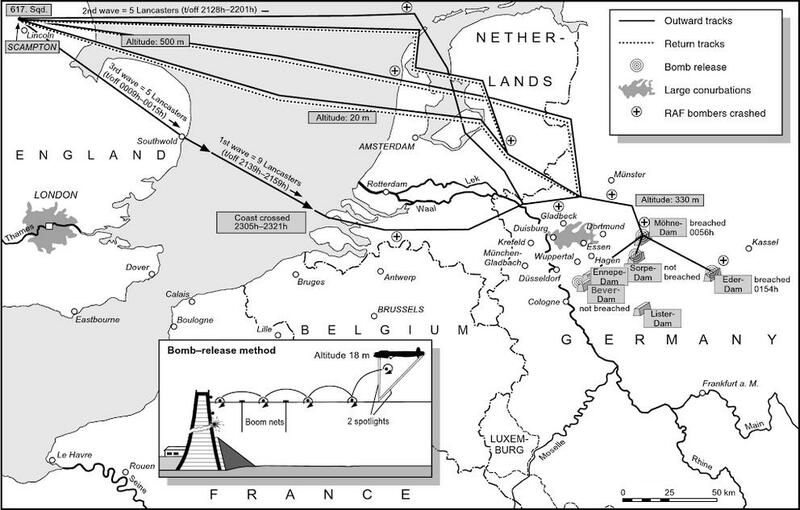 As a result of the Ladbergen breach [in the Dortmund-Ems canal], rail communications between northern and central Germany and the Ruhr had now become even more important, not only for the supply of industrial materials but also to those armies facing the Allied forces in Holland. 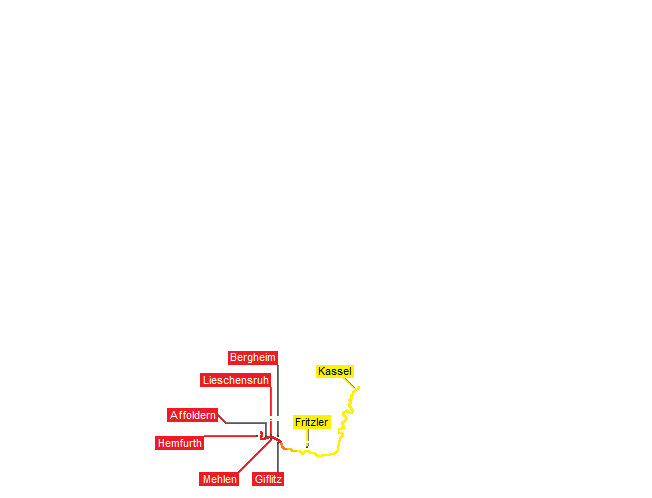 One of the three main lines serving the Ruhr from the east was the Neheim-Schwerte railway. It could be put out of action by the destruction of the Sorpe dam, just a few miles away. The next use of Tallboy would be due to the idea that Wallis had put forward the previous May regarding further attacks on the Sorpe. 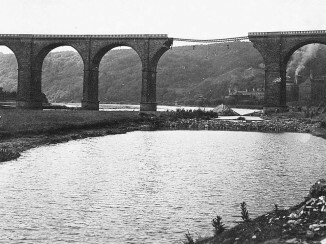 In a letter of 12 September Wallis had said of earth dams: 'if the balance of forces can be upset by relieving pressure on the air side of the dam, excess of pressure on the water side will produce a crack in the relatively thin concrete bulkhead and through this crack a stream of water will pour which will have the effect of eroding the rubble on the air side, thus accentuating the out of balance forces'. He felt this process might go on for days and would lead to the complete destruction of the dam. This had been hoped for after the Upkeep hits. On 15 October 1944, 18 Lancasters of 9 Squadron set out to attack the Sorpe dam. Hits were seen on the face of the earth dam but no breach was made. The left picture above shows the aftermath of the attack on the Sorpe dam with 12,000lb Tallboy "earthquake" bombs on October 15, 1944. The craters in the picture are 15 metres deep and up to 30 metres across and numerous ring-shaped cracks appeared in the dam. On the crest the concrete wall has been smashed open leaving two craters 30 to 40 metres wide, 12 to 16 metres deep, and at the point of the third impact on the crest, the wall has been pushed aside leaving gaping holes. 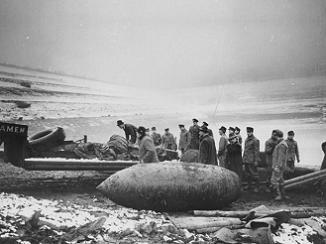 In late 1958 the Sorpe reservoir was drained for bomb damage repairs, in the course of which, shortly before Christmas, workers discovered an unexploded Tallboy bomb. 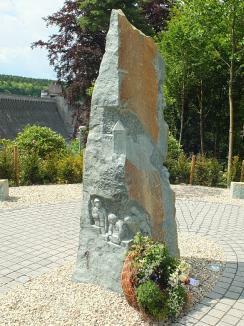 On January 6, 1959, the whole village of Langscheid was evacuated while North Rhine-Westphalia's chief bomb disposal officer, Walter Mietzke, and British Lieutenant, James M. Waters, jointly defused the 3.6m long bomb that still contained 2.5 metric tonnes of high explosive and 3 highly unstable tail-fuzes. 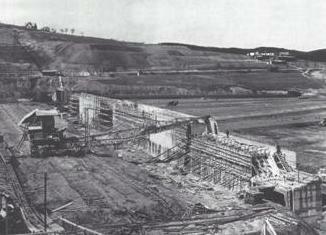 The damage caused by the Möhne dam breach in the Ruhr valley, particularly between Neheim and Hagen, was considerable. However, it did not reach the effect hoped for by the British planners, against their better judgement. Certainly, the effectiveness of Upkeep against the Sorpe dam was speculative, and it had been established that a combined destruction of the Möhne and Sorpe dams was worth much more than twice the destruction of one. The economic damage from the Möhne dam breach alone was still considerable. There were production losses for several days in the adjacent locations Dortmund, Hagen and Bochum, and the water supply remained affected for several weeks. Although the indirect consequences of the attack had been resolved by July, it had required a considerable amount of resources that were missed in damage repairs in other bombed cities and in the defense industry. The number of Germans killed exceeded 600, mainly civilians and mostly from the flooding in the Möhne and Ruhr valleys. More than 1,000 French and Belgium prisoners-of-war and Dutch, Polish and Soviet forced labourers, housed in a number of camps close to the breached dams, also died in the floods. These included close to 500 female labourers from the Ukraine. Publications by the British press about the extent of the flooding and damage proved to be speculation. The [initial] reports gave the clear impression that all three dams were ruptured. We now know that the Sorpe dam was almost untouched but, given the lack of solid information at that time, the press was forced to indulge in wild speculation. The Scotsman was swift to include facts provided by Reuters and neutral sources that told of fifty-four towns having been flooded, 4,000 Germans killed and 120,000 people having been driven from their homes. The Times assessed at great length how the loss of water in the dams would not only reduce hydroelectric power production but would disrupt coal mining and lead to a shortage of fuel to drive German armament production. It was also claimed that the destruction of so many roads and bridges would reduce the flow of supplies to the Eastern Front. Much of the mis-reporting on the British side was through ignorance and wishful thinking. Everyone wanted to believe that all three dams had been breached and that all the damage caused by the flooding would constitute a decisive turning point in the war. We now know that this was not the case. The greatest value of the raid lay undoubtly in its propaganda impact. For Churchill, it was a much-needed shot in the arm. His American and Russian allies had started to fear that he was only good at spouting inspiring rhetoric. This operation seemed to show that Britain was, at last, doing something positive to win the war. 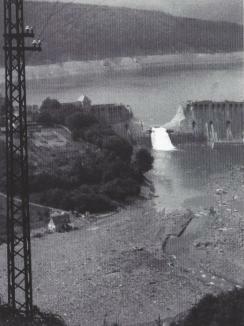 The Eder dam was put on the target list because of the size of the reservoir. Its destruction held no important strategic value. Already beforehand the RAF Air Staff report concluded that the economic effects would be unlikely to be substantial, and the moral effects would be important if the operation was carried out in conjunction with the M�hne and Sorpe dams. The stated aims of Operation Chastise were to interrupt steel and armaments production in the Ruhr district, by flooding factories, damaging transportation infrastructures, disrupting water supply and halting generation of hydro-electric power. Further to spread panic among the population and to lower the enemy's morale, while boosting morale on the home front. 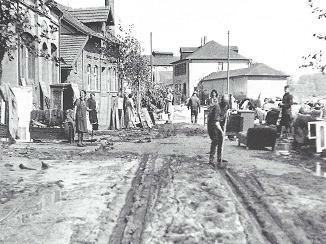 The Möhne flood destroyed 11 small factories, and severely damaged another 41 factories. However, these factories did not constitute major steel or armaments concerns. One iron foundry and an aluminium factory were destroyed, but other factories making artillery shells, small-arms ammunition, aircraft and U-boat parts, and bunker reinforcement materials were little harmed. The transportation network was affected with the destruction or severely damaging of 9 railway bridges and 25 road bridges. This aim was accomplished, at least temporarily. Water supplies fell for a short time due to the clogging of pumping stations with silt and debris from the deluge, but returned to 80% within three days. Sufficient rainfall caused that the level of underground quantities of water did not become a concern in 1943 and 1944. Two hydro-electric powerplants were destroyed and seven others were damaged. 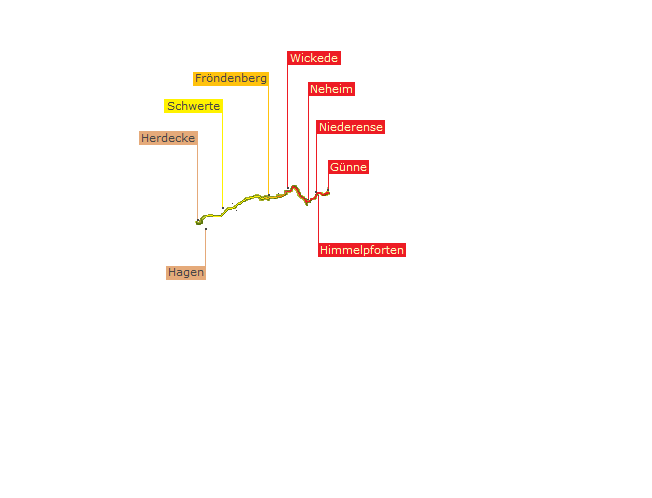 Especially important was the Herdecke plant (132,000 kW), where electricity generation was halted for two weeks. However, this represented only 15% of the region's electrical generation capacity and Germany's efficient grid system enabled alternative supplies of electricity. Armaments production returned to full capacity within two weeks. Estimates of Chastise's impact on armaments industries in terms of reductions in productivity vary from 5% to 35%. In truth, the real extent of disruption to production due to this single operation are lost amidst the overall effects of the ongoing Battle of the Ruhr; they cannot be determined seperately. 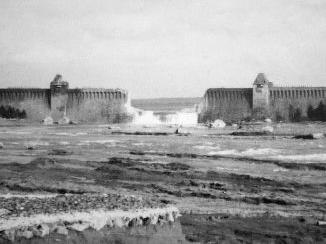 The lack of success against the second main target, the Sorpe dam, should not be seen as any kind of failure on the part of the crews. The basic fact was that the earth dam was not vulnerable to Upkeep. Including the Sorpe on the target list using this weapon was an erroneous operational decision. A second operational error was not including the Sorpe in the mission briefing for the reserve-force aircrews. They were briefed to attack targets 'X' and 'Y', if these still stood, or individually assigned 'targets of last resort'. The fact that the Operational Orders excluded target 'Z' from the reserve force's target list, then changed assignments 'on the fly' to include that dam, clearly demonstrates the fault. To expect the crews to successfully attack a target for which they were not briefed is clearly inappropriate. The destruction of the Eder had a smaller effect, with much less strategic impact. The four power stations were put out of action. Fourteen bridges were destroyed. The workplaces that were affected were not related with the war effort. The objective to spread panic among the population and to lower the enemy's morale proved difficult to achieve, especially against a nationalistic police state. There is no measurable evidence that this aim had been met. On the other hand, the operation was a tremendous uplift for the British. The Public Relations blitz began immediately, with the first Air Ministry communiqué being enthusiastically broadcast by the BBC. The story was front-page news in the British papers that evening. Next morning the first RAF photo-reconnaissance pictures were released, adding fuel to the spreading media wildfire. The media extravaganza climaxed on 22 and 29 May with two-page spreads in the Illustrated London News, one of them headlines 'A titanic blow at Germany: RAF smash Europe's mightiest dams'. From all this, the legend was born. Many of the myths it generated persists today. British Air Marshal Arthur Harris saw the attack from the outset as an unnecessary diversion of the bombers from their true role of area bombing on centres of population. Harris felt it far more likely that an attack like the dams raid would be, as all previous long range targeted attacks by heavies had proved, a costly failure. Harris saw the attack from the outset as an unnecessary diversion of the bombers from their true role of area bombing. He did not at first believe that the 'Upkeep' bouncing bomb would work at it was supposed to. He felt it far more likely that an attack like this would be, as all previous long-range target attacks by heavies had proved, a costly failure. The fearlessly pressed-home but on the whole misplanned and fairly ineffectual night attack on the the Ruhr dams provided proof of the rightness of the theory of area bombing, and the unprofitability of precision raids; though in the media, still well after the war, it was being described in almost mythical terms as a decisive act of heroism. The Ruhr's main water supply came from the Rhine to the west, and from the dam at Haltern in the north, beside the Sorpe basin. Though the attack was outwardly celebrated as one of the most important events in the war, the effects on German war industry was slight, apart from a 9 per-cent drop in coke production for two months. The damage caused by the inundation to houses, railways, roads, bridges, and minor water and electricity works in the Möhne-Ruhr valley was overcome within a few weeks or months. The waters from the Eder dam poured towards Kassel, where they caused some flooding but mostly only temporary agricultural damage. In one telling letter of December 1943 to Norman Bottomley, the Deputy Chief of the Air Staff, Harris wrote: 'For years we have been told that the destruction of the Möhne alone would be a vital blow to Germany. Both the Möhne and the Eder Dams were destroyed and I have seen nothing, either in the present circumstances or in the Ministry of Economic Warfare reports, to show that the effort was worthwhile except as a spectacular operation'. For Harris, the entire project summed up the pointlessness of panacea targets compared to area attacks. He was still keeping up the same refrain towards the end of the war, when he told Portal: 'The destruction of the Möhne and Eder dams was to achieve wonders. It achieved nothing compared with the effort and the loss. Nothing, that is, but a supreme display of skill, gallantry, devotion and technical ingenuity. It appears that the vital industrial water supplies sprang in fact from wells in the Ruhr which could not be depleted unless the dams were kept out over a matter of years, drought supervened and the whole water table of the Ruhr could thereby be lowered. Another afterthought: the material damage was negligible compared with one small area attack'. The dams raid during the Battle of the Ruhr point out a major factor in the failure of British bombings to achieve decisive results. The air commanders tended to overestimate raid damage and underestimate German recuperative powers. The dams raid point out a major factor in the failure of bombing to achieve decisive results. Luck eliminated most of the aircraft ordered to take out the critical Sorpe Dam; as a result, only the Möhne and less important Eder Dams received damage. To their surprise, the Germans were able to repair the Möhne Dam by the fall of 1943 with no interference against the vulnerable reconstruction work. Allied air commanders still tended to overestimate raid damage and underestimate German recuperative powers. Bomber Command pounded Germany in the spring of 1943 at a terrible cost to itself. Losses in the Battle of the Ruhr reached the point where Harris' forces flirted with defeat. In 43 major attacks, the RAF lost 872 bombers with 2,126 damaged. At the end of September, 1943, the industry in the Rhineland and Ruhr had largely recovered from the effects of the British bombings during the Battle of the Ruhr campaign. Only four to six weeks of industrial output were lost. Only four to six weeks of industrial output were lost, as the dispersal of industrial concerns such as Rheinmetall-Borsig of Düsseldorf had already begun. The cost to Bomber Command of 43 major raids was, however, considerable: about 18,500 bomber sorties were made, with a total loss of 872 (4.7%) of the aircraft, with their crew-members numbering some 6,000, and a further 2,126 aircraft sustained sometimes irreparable damage. With average total losses of 5%, the offensive would have been unsustainable in the long term, and already 16% of all aircraft used were falling into the two loss categories. 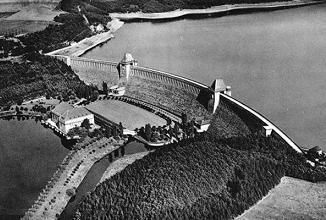 The results of the attacks on the dams were largely in line with the views of the Scientific Advisers, as drawn up in the Ministry of Economic Warfare memorandum of April 2, 1943. 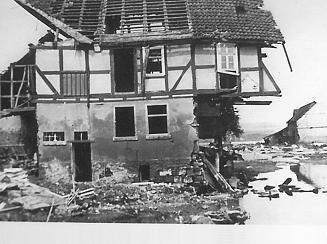 The destruction of the Möhne dam caused considerable damage in the more rural areas closer to the dam, particularly between Neheim and Hagen. The destruction of the Möhne dam alone did not have any large or immediate effect on the supply of industrial and household water in the heavily industrialized and urbanized Ruhr district further downstream of the Ruhr river. A difficult situation might have developed by the end of the summer if rainfall, speed of repairs and measures to obtain additional water were all unfavourable, but that did not happen. The destruction of the Sorpe dam would have reinforced the effects of the destruction of the Möhne dam, and would have greatly enhanced the prospects of the development of a water supply shortage in the Ruhr area. However, the attack on the Sorpe dam had little or no chance of success. The destruction of the Eder dam did not affect industrial areas, apart from the inundation of the low-lying districts of the city of Kassel, and did not affect the navigability of the lower reaches of the Weser or the supply of water to the Mittelland Canal. Besides, also the RAF Air Staff had already concluded beforehand that no substantial economic effects were to be expected. They hoped for moral effects in conjunction with the two Ruhr dams mentioned above. In the evening Speer calls me and gives me a report on the reservoirs catastrophe. He flew there immediately and has inspected the damage inflicted. Thank God it is not as severe as Speer had initially assumed. The British had not succeeded, however, in destroying the three other reservoirs. Had they done so, the Ruhr Valley would have been almost completely deprived of water in the coming summer months. That night, employing just a few bombers, the British came close to a success which would have been greater than anything they had achieved hitherto with a commitment of thousands of bombers. But they made a single mistake which puzzles me to this day: They divided their forces and that same night destroyed the Eder Valley dam, although it had nothing whatsoever to do with the supply of water to the Ruhr. 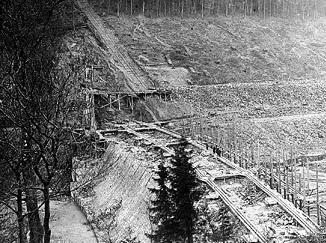 A few days after the attack, 7000 men, whom I had ordered shifted from the Atlatic Wall to the Möhne and Eder areas, were hard at work repairing the dams. 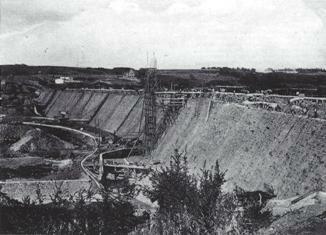 On September 23, 1943, in the nick of time before the beginning of the rains, the breach in the Möhne dam was closed. We were thus able to collect the precipitation of the late autumn and winter of 1943 for the needs of the following summer. While we were engaged in rebuilding, the British air force missed its second chance. A few bombs would have produced cave-ins at the exposed building sites, and a few fire bombs could have set the wooden scaffolding blazing. The greatest effect was on British morale. 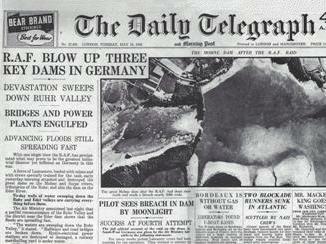 News of the Dambusters raid filled the front pages, detailing the events of the night, showing its success complete with aerial photographs of the flooding Möhne dam and offering an analysis of the likely short term and long term effects on Germany's industrial production in the Ruhr. Wing Commander Guy Gibson became a celebrity. I have seen nothing in the present circumstances or in the Ministry of Economic Warfare reports to show that the effort was worthwhile. It achieved nothing compared with the effort and the loss. The material damage was negligible compared with one small area attack. The effects were not, in themselves, of fundamental importance nor even seriously damaging. The sudden catastrophe which inundated the areas lying below the two dams was local, temporary and largely agricultural. The effect on the German war effort proved to be negligible due to the speed with which they succeeded in controlling and then repairing the damage. 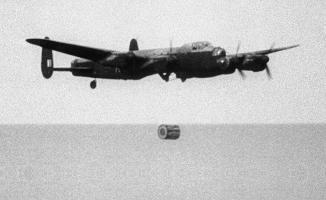 The most enduring significance of the raid was the development of bombing and target-marking techniques which followed from it. Levine wrote about the Dambusters raid in his book The Strategic Bombing of Germany that errors in planning the attack, the ill luck of the planes assigned to the Sorpe, and the failure to follow up the success against the Möhne prevented the operation from dealing the truly crippling blow that it might have. 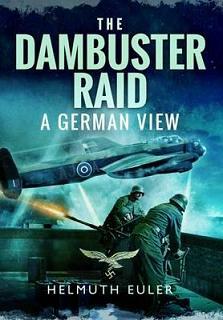 British historian Richard Overy said that although there were feelings at the time the Dambusters raid might actually seriously damage the German war economy, the raid could never have really been a knockout blow. The idea that the raid could somehow cripple industry for good was sheer fantasy. The attack did not significantly damage industrial production. Dildy wrote in his book about the Dambusters raid that the major aim was the positive influence the raid would have on Britain's allies; the USA and the Soviet Union. This was the primary reason for the considerable amount of propaganda accompanying the operations, related to the highest levels of British government. The Soviets were clamouring for the Western allies to open a 'second front' against Germany. The Americans lacked confidence in British military leadership, technology, tactics and techniques, given Britain's disappointing record of misadventure in the first three years of the war. A dramatically successful high-profile aerial operation would do much to solidify the support of Britain's two main allies in pursuing the war to a victorious conclusion. German author Helmuth Euler wrote in his book about the Dambusters raid that the expected strategic advantages for the Allied forces failed to materialise. Historian Amanda Mason of the Imperial War Museum concluded in her article about the Dambusters raid that although the impact on industrial production was limited, the raid gave a significant morale boost to the people of Britain. The official assessment of the bombing campaign (the British Bombing Survey Unit, The Strategic Air War Against Germany, 1939 - 1945) neglects to mention the raid entirely. So was the Dambusters raid a success? British author James Holland says that the Dambusters raid was a glorious British success and made the British win the war. The Möhne, Sorpe and Eder dams were particularly important for the Ruhr district since they controlled an immense water supply, vital not just for steel production but also for the canal transport network and drinking water. The attack played a vital role to ease the war on the east front, the upcoming front in Sicily, the invasion of Normandy, the stalling of aircraft production after the unsuccessful German offensive in the Battle of Kursk, and it was a massive psychological blow. This is the truth behind what the Dambusters raid achieved and in no way should it ever be belittled, Holland says. British professor Richard Morris wrote that the Dambusters raid was not a success if Chastise succeeded on its own terms. It did not bring about the long-term crisis for which planners in the Air Ministry and Ministry of Economic Warfare had hoped. There were two main reasons for this: the attack had focused on the wrong combination of dams; and it was planned as a stand-alone operation by a small force rather than as part of a sustained campaign by a larger one. To bring about a systemic economic failure the RAF needed simultaneously to destroy a number of dams, in particular the Sorpe as well as the destroyed Möhne, and the pumping systems that linked them, and then re-attack them at intervals to prevent repair. Definitely, for the unfortunate inhabitants of the local towns and camps who witnessed the drowning of people, and lost their family, neighbours, fellow sufferers and friends, it was a catastrophic event. 2017 Thesis submitted for the Degree of Masters in Historical Research (MRes) in the University of Hull. RAF website (archive) about Operation Chastise. However, the RAF website somewhat disguised that the dams raid did not reach the effect hoped for against hope. Until 2013, the RAF website downplayed (source) the priority of the Sorpe dam in the dams raid operation, while in this later version other results from the Battle of the Ruhr campaign, and beyond, are attributed to the dams raid. Münster trip report 15/17 November 2014, with a visit to the Dortmund-Ems Canal aqueducts near Ladbergen. In the meantime, German author Helmuth Euler (1933), who has studied the Dambusters raid for decades, has published early 2016 his latest book about the Dambusters raid. The subtitle "A German View" is probably added to discern it from other books, but that is far too modest. Helmuth Euler explores the operation from both sides without any nationalistic undertone or subjective reasoning.